I was grocery shopping at Safeway the other day, and it doesn’t matter if I need to go down the coffee aisle or not, every time I go to the grocery store, I wander down the coffee aisle just to see if there is anything new. On the bottom shelf, I saw these bright, colorful bags. I picked one up and couldn’t believe my eyes. 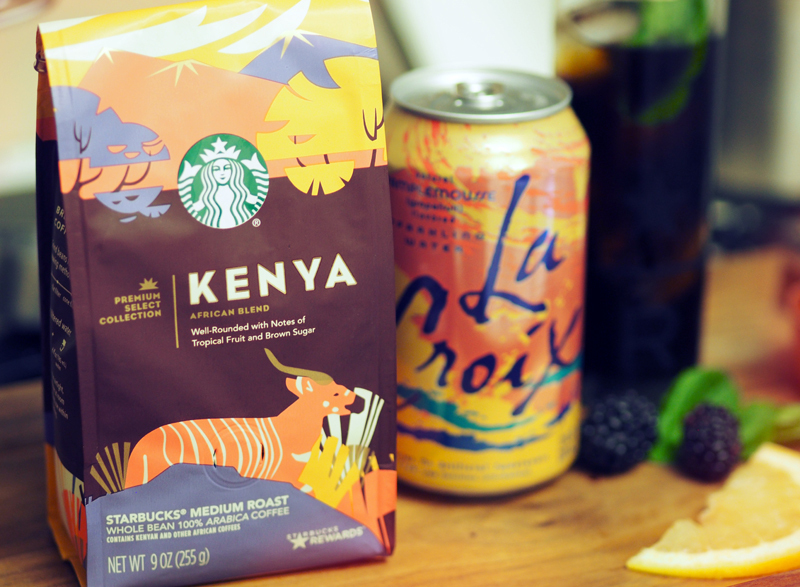 Kenya was in Safeway, along with Brazil and Costa Rica. Of course I had to buy them all and fall in love all over again. The first thing I thought of when I saw this bag was Grapefruit LaCroix (don’t judge me!!) 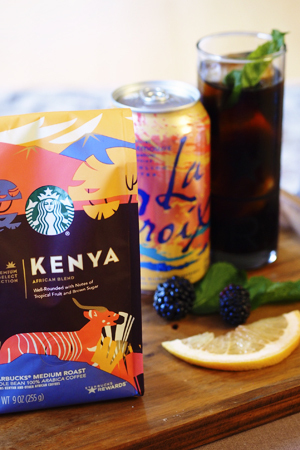 I’m sorry, but the colors and the styling are so similar, and it’s so fitting because Kenya has that incredible grapefruit like acidity. I decided to continue with my slight obsession with cold brew sodas since it is still in the triple digits here in Sacramento! 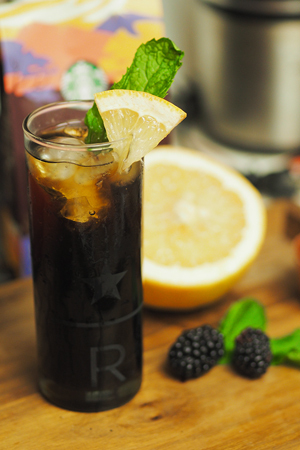 For this recipe, you will need to make a cold brew concentrate. Making cold brew is one of the most popular questions I receive, and there are several different ways I like to make it, mostly depending on the batch size. For this, I am just doing a small batch, no special equipment needed. Just 1 cup of coffee, ground on a coarse setting (french press) and 2 cups of room temperature filtered water. Make sure the grounds are fully saturated and let steep for about 16 hours in a cool dark place. Then strain and refrigerate. Super easy, the most difficult part is waiting the 16 hours! Combine all ingredients in a small saucepan. Slowly bring to a boil, stirring until sugar has dissolved. Remove from heat and let sit for 5 minutes. Gently squeeze the blackberries against the side of the pan to help release the juices. Strain into an airtight container, and keep covered and refrigerated. Combine cold brew concentrate, simple syrup and LaCroix water. Pour over ice. Garnish with fresh mint and grapefruit slices if desired. As far as I know, these new Premium Selection Coffees are only available at Safeway grocery stores. 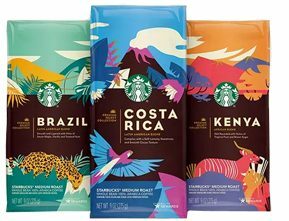 There are currently three offerings, Costa Rica, Brazil and Kenya. Over the next few weeks I will be highlighting each of these coffees, so please check back! 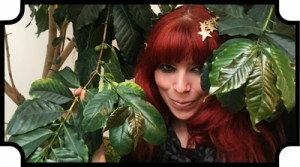 OMG my wife and I absolutely LOVE the Starbucks Kenya and was were very disappointed to hear it was being discontinued. We scoured every Starbucks here but by the time we had heard there were no bags left to be found. This is amazing news!! We live in NJ where there are sadly no Safeway stores, so I found the closest one is in Delaware. Upon calling they gentleman who answered the phone looked and could not find it or a shelf tag, or a way he could order it in his system, but said it might be select stores or limited availability they just send when they have. I would love to find out which store you saw it so we could try and ask them to send us a few bags – its like liquid gold!